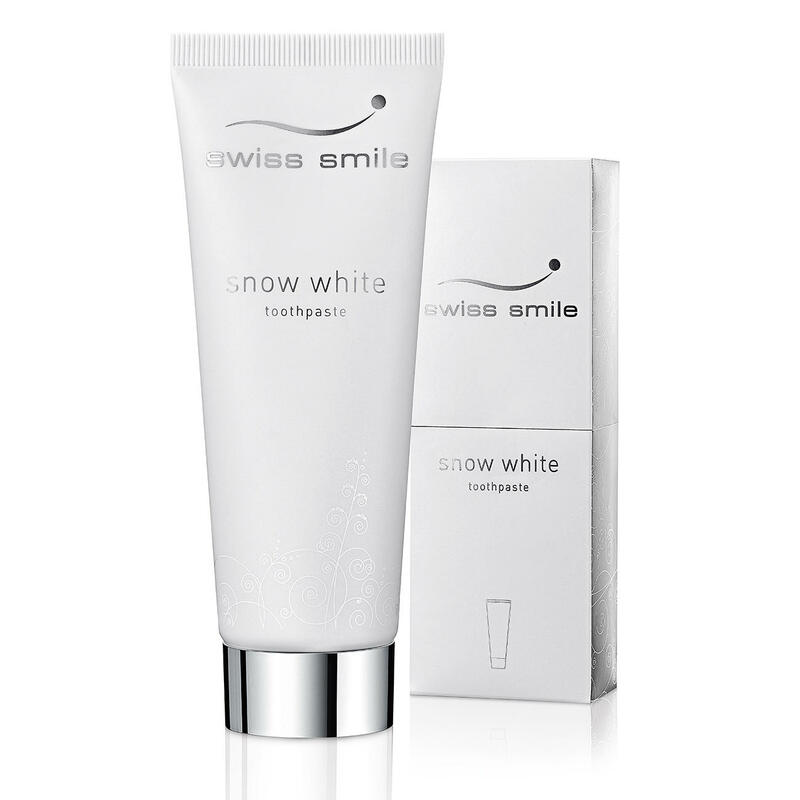 swiss smile Whitening Toothpaste or “Pearl Shine & Repair.. The original from Switzerland – with a unique combination of active ingredients. The perfect addition: The “Pearl Shine & Repair Conditioner“. Smooths, protects and makes your teeth radiant white. Brilliant pearly whites. Without aggressive abrasives, chemical brighteners, or peroxide. The gentle whitening toothpaste from the “swiss smile” clinics. The swiss smile dental clinics are part of the renowned association LDCW® Leading Dental Centers of the World. A whitening toothpaste was developed specifically for the demanding clinic customers to effectively brighten teeth in a gentle and natural way. Without aggressive abrasives, chemical brighteners, or peroxide. Now you can also order this ingenious whitening toothpaste - directly from Pro-Idee. Start your day nice and fresh by brushing your teeth with the swiss smile Whitening Toothpaste every morning. This also effectively removes deposits from food such as tea, coffee, etc. Also ideal in order to prolong the effect of professional bleaching. Refreshing and delicate mint flavour. A 75ml (2.53 floz) standing tube lasts for approx. 120 applications / 4 months. This fine tooth foam contains bright white micro-crystals which are extracted from the nacre found in seashells. The structure of these particles made from the mineral hydroxylapatite (HAP) is very similar to tooth enamel. In fact these crystals are able to adhere to the surface of the teeth, allowing them to even out rough patches and build-up a smooth protective layer. Use the nacre foam every day, after you have brushed your teeth in the morning. Even after eating, drinking tea or coffee, etc., the tooth foam will leave your teeth feeling fresh and pleasantly smooth. Does not contain any aggressive abrasives, bleaching agents or acids. 75 ml (2.6floz) dispenser for approx. 300 applications/10 months. Also suitable for implants and dentures. 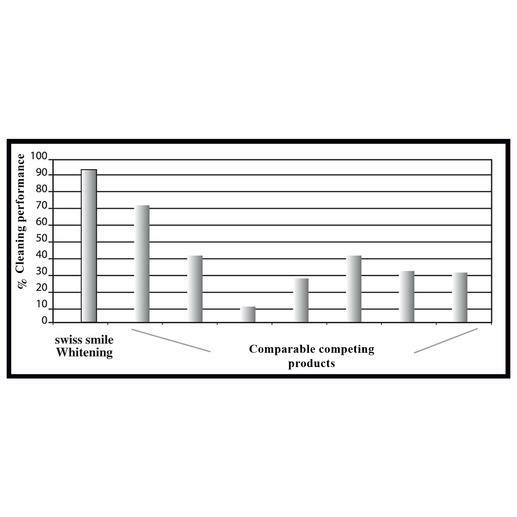 The effect of 6 popular whitening toothpastes was studied in an in-vitro study administered by Prof. Martin Addy. 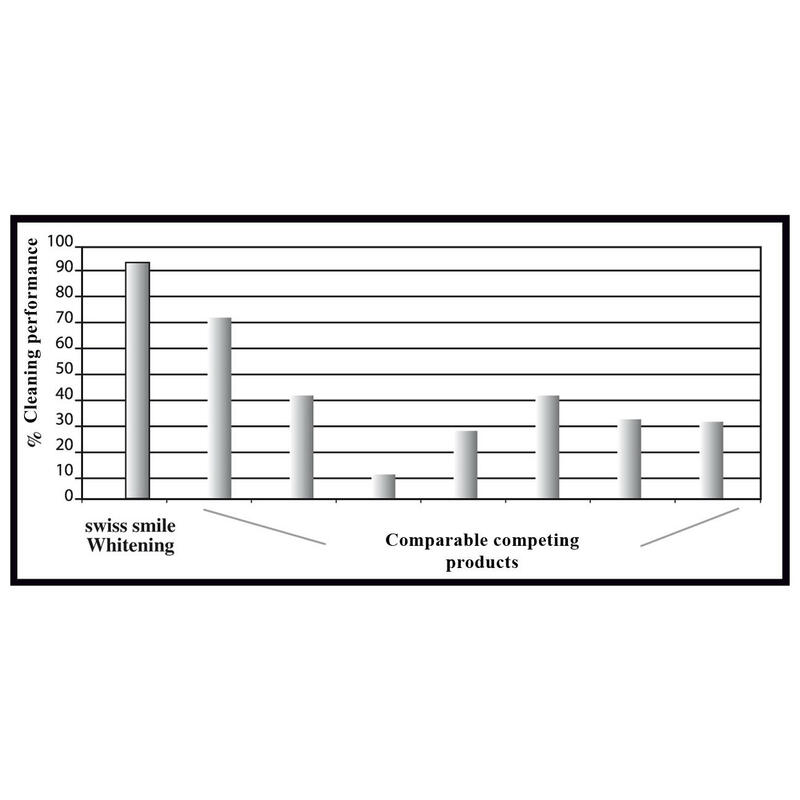 A clear winner was established during cleaning of a substrate discoloured by black tea: swiss smile achieved a score of 92%, the 2nd place only reached 74%, and the least effective whitening toothpaste only reached 12%. This confirms: swiss smile is by far the best at removing tooth discolouration.